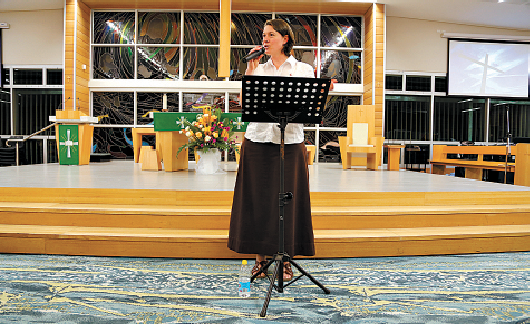 Spirit seminar: Sr Rosie Drum from Quakers Hill, Sydney, speaking on God’s love at the Life in the Spirit Seminar, Jindalee. THREE members of the Missionaries of God’s Love united in Brisbane on August 24 to run a charismatic seminar at Twelve Apostles parish Jindalee. Sr Rosie Drum, Fr Dave Callahan of Canberra, and Melbourne Deacon Chris Eaton co-ordinated a Life in the Spirit seminar for Catholic Charismatic Renewal Brisbane. Life in the Spirit seminars are run by Catholic Charismatic groups, such as the Disciples of Jesus Covenant Community, to which the MGLs are consecrated. The seminar looks closely at the topics of God’s love, salvation, new life in the Holy Spirit, receiving God’s gifts, committing your life to Christ, growing as a Christian, and transforming your life in Christ. CCR Brisbane leaders said the seminars were an opportunity for people to have a personal relationship with Jesus through the power of the Holy Spirit. LP Seow, a founding member of a charismatic prayer group at Twelve Apostles, had a life-changing encounter with a charismatic group in his hometown Malaysia. He has since worked with CCR Brisbane on a number of their events, including Life in the Spirit Seminars. “We would like people to come to the realization that Jesus is not just someone you read about, talk about, or know about, but someone you can have a personal relationship with,” Mr Seow said.